Recently we found a product bulletin from Mettler Toledo regarding their XRT price computing scale. The date on the paper says December 2006 but there are still quite a few of those scales still out in the marketplace. The bulletin says that after receiving several calls and evaluating several XRT-3710 and XRT-4710 scales, the factory determined that the scales had inadvertently been programmed by the user to weigh in the “weigh only” mode. Now the “weigh only” mode of the XRT is a feature option that is accomplished by pressing the “5” key while powering the scale on. When in the “weigh only” mode, standard price computing features and corresponding keypad functionality is disabled. To return the XRT scale to normal price computing status in the event it has been placed in “weigh only” mode, please follow these simple steps below. Following these steps will reset the scale to its full price computing mode with all corresponding keypad functions restored. 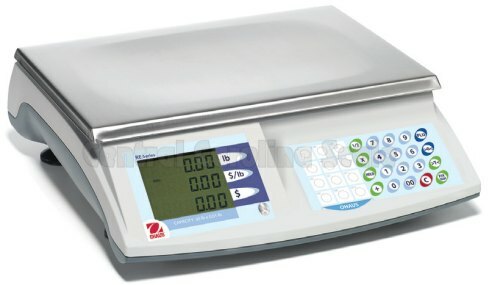 As we mentioned, this is applicable to the Mettler Toledo XRT scales. We’re not sure if this same combination works with the Ohaus RE series. You may want to contact the company where you purchased the scale just to be safe. Hope this information helps you out. 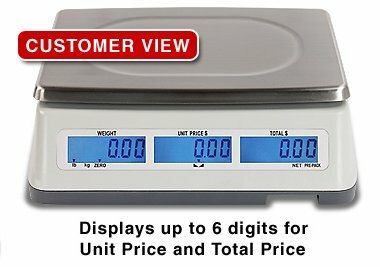 We recently received a new Digiweigh DWP-30PC price computing scale for review. We see all kinds of retail scales so anytime a new one comes out, we can’t wait to get our hands on it so see how it performs. The scale features a 30 pound capacity and calculates the price per pound of items you place on the scale platter. The DWP-60PC is also available which has a 60 pound weighing capacity. Our honest assessment of the scale is below. The DWP-30PC scale arrived in a sturdy cardboard box with styrofoam packing inside. Setting up the scale was pretty easy. The LCD display is easy to read and is located on both the operators side and the customers side. The scale is NTEP legal for trade which is pretty much the standard when it comes to selling fruits, vegetables or candy by the pound. The scale operates on regular AC power and there is also a built in rechargeable battery. The scale is fairly compact, so if you’re used to a large price computing scale like the Ohaus RE15US or the old CAS TP-1, this is going to appear very small to you. Overall the scale was fairly nice and we don’t really have anything negative to say except the manual seems a bit hard to read. But since everything comes from China these days, we almost always expect the manual to be a challenge. Many times when you think of a certified scale for produce you may think of hanging scales with a dial. 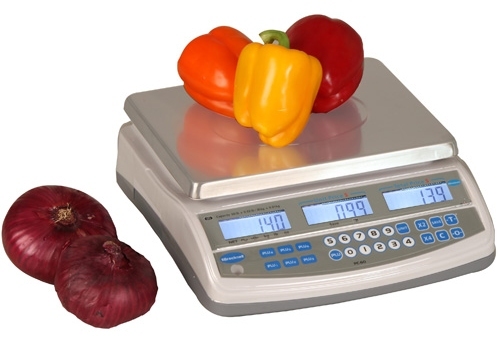 While those do still exist, most of today’s sellers are opting to use the digital counter top scale to weigh produce and vegetables for their customers. It really makes sense. The prices are affordable and the scales are well built. Since most either come with rechargeable battery or operate on regular flashlight batteries, it really makes more sense than ever to go with the standard digital produce scale.